Contact us for an application form, or download an application form here. Please return your completed application form with a deposit of £60 to secure your place. 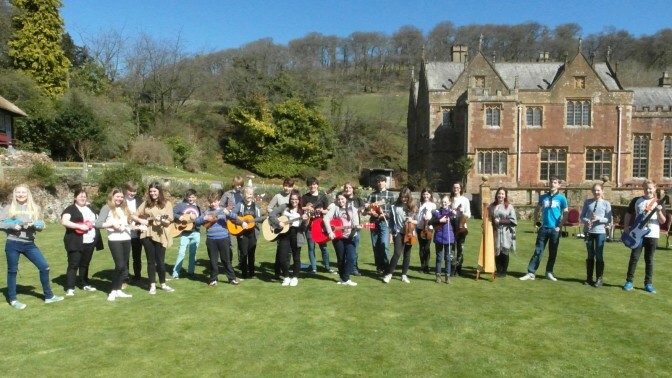 Developed from our popular Hothouse project, this week-long music residential for young musicians and singers is designed as an intensive but fun introduction to our folk traditions. It is led by a team of young professional folk practitioners – Nicola Lyons & Jim Molyneux of 4Square, and demi-tutor Joe Hardman – supported by lead tutor Will Lang and pastoral lead Claire Bailey. This course is designed as an introduction to folk for young people aged 12-18 (ie secondary school age and above). Prior experience – as either a singer or musician – is essential, but it’s ok if you’re new to folk. It’s intensive and hard work at times, but we guarantee you’ll have fun too and make new friends. And if you’re hooked on folk, you can come to our Summer ‘Intermediate’ Young Halsway Week which culminates in performances at Sidmouth Folk Week! Contact us for an application form, or download an application form here. Please return your completed application form with a deposit of £60 to secure your place. The balance of £135 is due by Mon 26 Feb. This will be Nicola’s third year as a member of the Young Halsway tutors’ team. Jim Molyneux studied at Chetham’s School of Music, and the Royal Northern College of Music. He is the co-founder of 4Square (with Nicola Lyons) and also a member of the “genre-busting cinematic folk septet” The Fair Rain (formerly The Old Dance School). This will be Jim’s second year as a member of the Young Halsway tutors’ team. Joe Hardman is a talented young singer and guitarist who has come through the Young Halsway programme. He was a participant on our first Young Halsway – Advanced course last year and plans to continue to study music. He is keen to develop his teaching skills and has demonstrated a natural talent for peer-led learning, becoming a sensitive and encouraging leader in previous courses – we’re delighted to be supporting him with this opportunity.